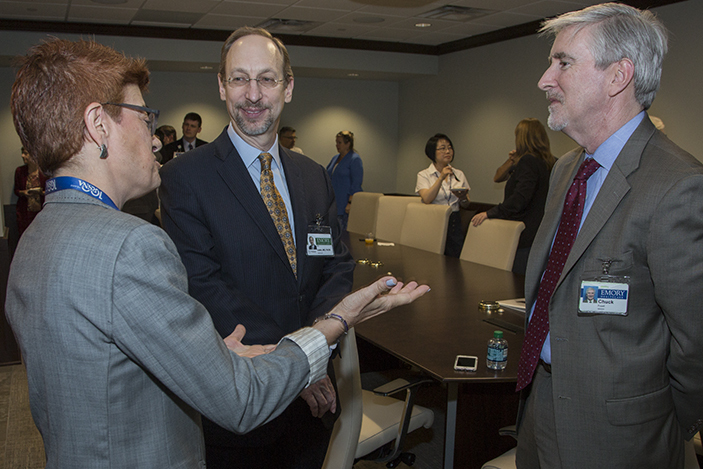 The Department of Radiology and Imaging Sciences hosted a very well-attended reception for Dr. Lewin on May 3rd where faculty and staff learned a little more about the acclaimed radiologist now leading the Emory Healthcare enterprise. 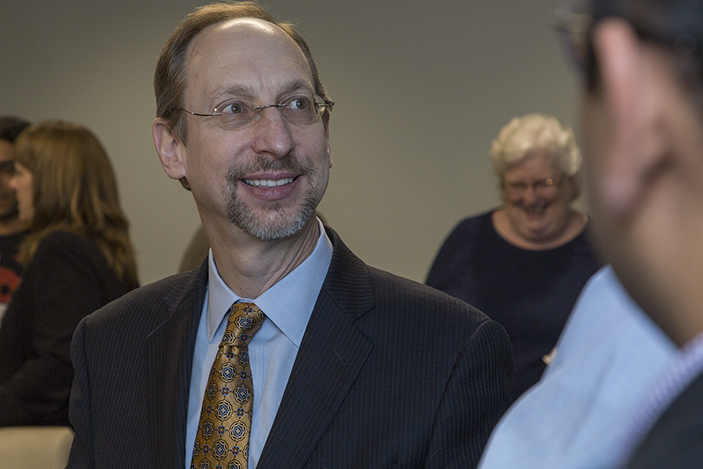 Dr. Jonathan Lewin is very busy and in demand as Emory University’s executive vice president for health affairs; Woodruff Health Sciences Center’s executive director; and Emory Healthcare’s president, CEO, and chairman of the board. 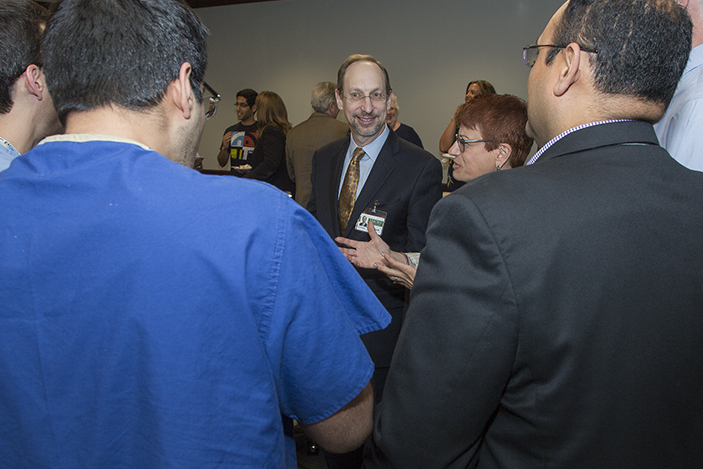 The Department of Radiology and Imaging Sciences hosted a very well-attended reception for Dr. Lewin on May 3rd where faculty and staff learned a little more about the acclaimed radiologist now leading the Emory Healthcare enterprise. 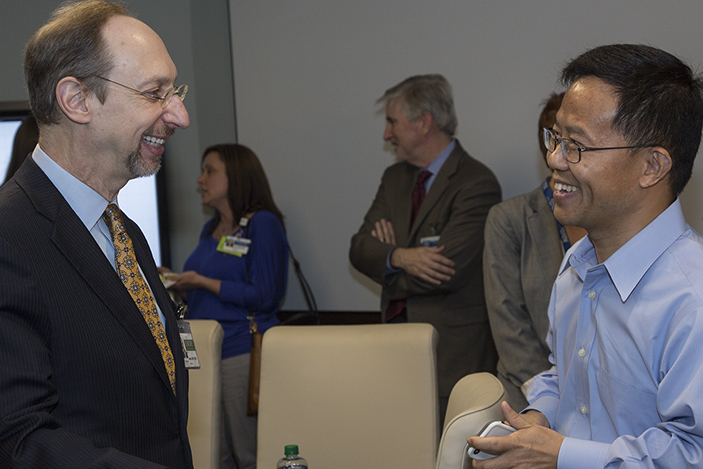 Following that reception, Dr. Lewin took time to respond to a series of Rad Report (RR) questions submitted by email, offering new insights about his move to Emory and his first months on the job. Dr. Lewin’s answers have been edited only for format and style. RR: What inspired you to make this move to Emory? 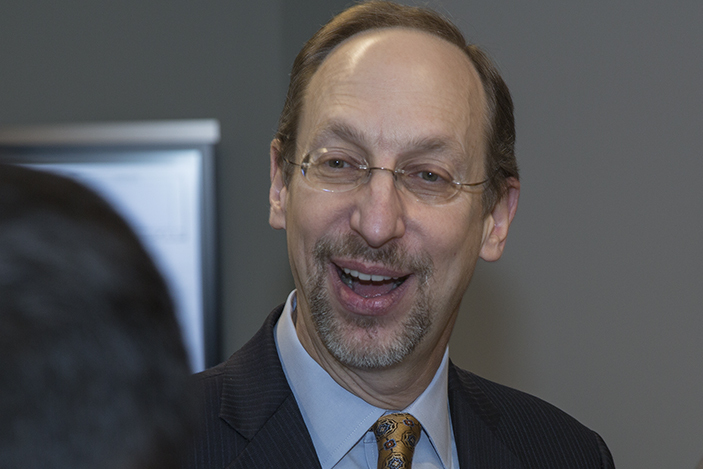 Dr. Lewin: As my work at Johns Hopkins Medicine became more involved with strategic planning, healthcare transformation, and clinical integration, I learned that I truly enjoyed complex organizational challenges and that to have the biggest impact, alignment between the academic and healthcare delivery missions was critical. Here at Emory, the structure of the Woodruff Health Sciences Center, including Emory Healthcare, is the absolute perfect structure to really make a difference in moving academic healthcare forward. The inclusion of the Nell Hodgson Woodruff School of Nursing and the Rollins School of Public Health adds a distinctive advantage as compared to almost anywhere else in the country. Once I started to learn about Emory, its talented and dedicated people, the community, and the organizational structure, the decision was clear. RR: Now that you’ve been here for a few short months, what is most exciting to you about your roles as Executive Vice President for Health Affairs, Emory University; Executive Director, Woodruff Health Sciences Center; and President, CEO, and Chairman of the Board, Emory Healthcare? Dr. Lewin: What I find most enjoyable about my new position is the variety of complex issues that I encounter each and every day. For example, I will go from a meeting looking at the university plans for an undergraduate student center to a discussion on major health system capital expenditures to a conversation around Comprehensive Cancer Center designation for Winship. I feel like I am pulling from each component of my identity and experience in research, education, business and finance, and clinical healthcare delivery every day, which is a tremendously gratifying role for me. RR: From where do you draw your inspiration to do the work you do? Dr. Lewin: I think that all of us in healthcare, whether physicians or other care providers, went into our fields with the desire to help others and to have a positive impact on society. If done correctly, my leadership roles should allow me to continue this personal mission in a meaningful way, helping a broader community that I could do in my former more narrowly focused clinical provider role. Than opportunity is both a challenge and a privilege, and one that I take very seriously in my new position. 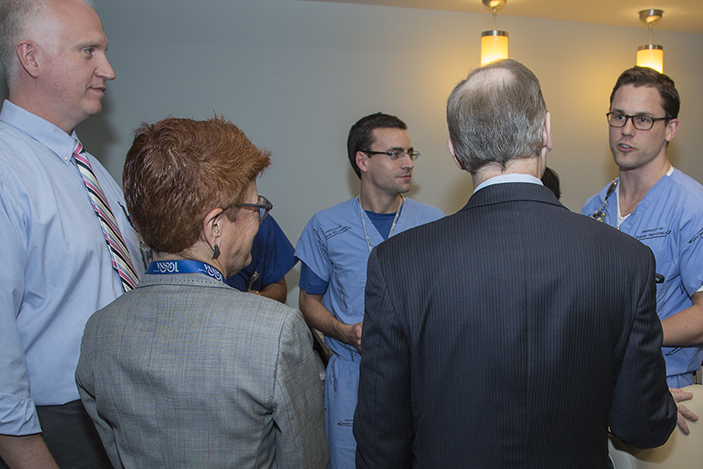 RR: What advice would you like to give our young radiologists, those just beginning their careers in medicine? Dr. Lewin: Find your passion, pursue it, and strive to be excellent in its execution. Whether one finds joy in education, research, or clinical practice, focusing on performing to your maximum current capabilities, learning every day, and continuing to improve is more important early in a career than trying to predict where you may want your career to go in five or ten years. RR: On the lighter side of things, what has been your favorite Emory moment so far? Dr. Lewin: Commencement ceremonies for the university and the School of Medicine were wonderful; sharing in the pure joy of the graduates and empathizing with the pride of their families and friends was a privilege, and a reminder of why our educational mission is so fundamental to all that we do in academic healthcare. RR: How long has it taken you to find your way around the Clifton Road Emory Healthcare campus without a map? Dr. Lewin: As I suspect that many of your readers will agree, we in radiology enjoy three-dimensional visualization challenges. Whether it’s head and neck anatomy or a new healthcare campus, the same skills come into play, and quickly learning new geography was a fun challenge to overcome. RR: What is your current favorite spot or place on campus? Dr. Lewin: Having spent twelve years in an urban healthcare campus, the coexistence of the Emory Healthcare campus with the rest of the university is a source of continual enjoyment for me. Every time I walk over to the university Administration Building for a meeting I’m reminded of how fortunate we are to be part of a beautiful and green campus. There is no single spot, but the entirety of the campus instead brings me joy.